You don't have to live on a plantation to outfit your home with plantation shutters. Impress your guests and neighbors with stylish louvered shutters from Duke Shutter Company in Acworth, GA. Our plantation louver shutters are stunning additions to your home. Best of all, they are cost-effective solutions to dress up your windows. Some of the most widely used shutters are louvered plantation shutters. Still, just because they are common doesn't mean they need to be ordinary. In fact, our plantation louver shutters are attractive, customized, and fully functional. They can open and close to provide privacy, temperature control, and protection from debris if there's a storm. Improve the aesthetic beauty of your home with decorative shutters from Duke Shutter Company in Acworth, GA.
What Makes Our Exterior Louvered Shutters Different? Not all shutters are created equal. In fact, cheaply made louvered shutters detract from the appeal and value of a home. Our louvered plantation shutters from Acworth, GA, are made with only premium products. Whether you admire them from the road or up close, you'll enjoy the same beauty and quality. 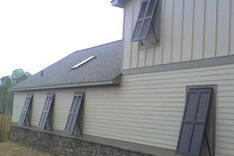 Mass-produced louver shutters cannot hold up to our custom-made products in Acworth, GA. Our unique shutters offer versatile ways to add decorative ambiance to the outside of your home. From vinyl to wood to composite, they come in a variety of styles, colors, and sizes. The attractiveness of our Acworth, GA, louvered decorative shutters lies in their appeal. Whether your home is in a rural or urban location, exterior louvered shutters are creative choices that enhance your home's windows. Most importantly, they decorate your house without costing a fortune to do it. Duke Shutter Company in Acworth, GA, customizes and installs decorative shutters that accommodate any window, no matter what the unique dimensions are. 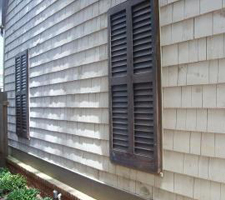 Most importantly, our team is skilled at installing exterior louvered shutters on any surface. Contact us to schedule a free in-home estimate when you want handcrafted louver shutters. We proudly serve customers in Acworth, Kennesaw, Canton, Woodstock, Marietta, Smyrna, Dunwoody, Johns Creek, Alpharetta, and Roswell, Georgia.